Posted on Sun, Nov 20, 2011 : 9:18 p.m. There are a lot of reasons to like the Michigan football team's chances this week against Ohio State. Try this on for size: The 17th-ranked Wolverines (9-2, 5-2) have faced two consecutive offenses that feature running quarterbacks and held them without a third-down conversion through the first 12 minutes of the third quarter. It took Illinois nine tries to convert a third down. In Michigan's 45-17 rout of Nebraska on Saturday, it took the Cornhuskers eight tries. And, hey, whaddya know? Ohio State has a running quarterback. Ohio State quarterback is Braxton Miller also is a threat to run, and the Michigan defense has handled that challenge well lately. OK, the Buckeyes' offense is vastly different than Nebraska's, and they use Braxton Miller differently than the Cornhuskers used Taylor Martinez and Illinois employed Nathan Scheelhaase two weeks ago. But, Michigan's work in edge containment — something that bothered the defense earlier in the year — has become a masterpiece. That was true as the Wolverines doubled the national average in stops on third-and-shorts throughout Big Ten play. Now, it's true as they get third-down stops of all varieties. The starters allowed only one third-down conversion in 10 tries against Nebraska. Defensive coordinator Greg Mattison's game plan against the Cornhuskers was clear: Threaten to blitz, then drop back into coverage. The Wolverines did it time and again with great success, mostly because they were still able to apply pressure with three- and four-man rushes. “We knew how dangerous they were, the weapons that they had, (quarterback Taylor) Martinez and (tailback Rex) Burkhead," senior Mike Martin said. "We took advantage of the strengths that we have on our side of it." Of the 10 third downs faced by the starting defense, six featured at least seven players on the line of scrimmage, and another had six. Each time, though, just three or four players rushed. Freshman linebacker Desmond Morgan lined up on the line each time, then dropped back into coverage. Redshirt freshman linebacker Jake Ryan lined up on the line each time, then alternated between rushing or dropping back into coverage. The biggest wild card was Martin, a 6-foot-2, 304-pound tackle who lined up anywhere from the interior to end and sometimes dropped back into coverage. 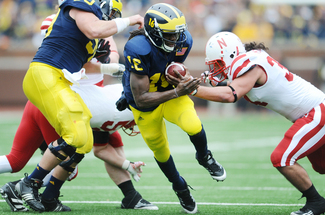 Michigan's shown glimpses of this look in the past, but it was particularly effective against run-oriented Nebraska. It could be as well next week against Ohio State. Martin was all over the place. He stood up at end on Nebraska's first third-down attempt, with Ryan down in the interior. Ryan dropped back into coverage after the snap, Martin rushed and put pressure on Martinez. It was an incomplete pass. On the next third down, all three linebackers lined up on the line of scrimmage before dropping back. Kenny Demens broke up the pass in coverage. The varied looks confused Nebraska, with the three- and four-man lines getting consistent pressure on Martinez. Shortly before halftime, for example, senior lineman Ryan Van Bergen got a sack as part of a four-man rush. Nebraska's first third-down conversion didn't come until the final 2 minutes of the third quarter, when Burkhead picked up 2 yards on a third-and-one play. The Cornhuskers' next third down try, though, was more of the same. Martin dropped back into coverage, and Ryan forced a Martinez fumble from behind. All told, the Michigan starters allowed one third-down conversion in 10 tries, and the one was a third-and-one. They allowed only one drive of longer than 32 yards, and only one longer than four plays. Nebraska finished 3-of-13 overall on third downs, while Michigan was 8-of-18. For the game, the Wolverines held the ball for 41 minutes, 13 seconds. Nebraska, just 18:47. Michigan ran 26 more plays than the Cornhuskers. It's hard for offenses to score on the Wolverines' defense right now. It's even tougher when they're not on the field. "I know for a fact that our defense plays better when they have a limited amount of time on the field," senior offensive lineman Mark Huyge said. "I didn’t know we held the ball for 40 minutes. It’s a good deal. Will Mattison have a new bag of tricks for Ohio State? Absolutely. But the fact the Wolverines have found a way to apply pressure with just three- and four-man fronts, and to become one of the nation's best on third down, is encouraging. That success has come the past two weeks against Scheelhaase and Martinez. Miller is of their ilk, but the freshman is no Scheelhaase, and he's certainly no Martinez. That bodes well for Michigan. Michigan quarterback Denard Robinson had his best all-around game of the season on Saturday. Quarterback Denard Robinson has drawn criticism in recent weeks, including in this space. He's been inconsistent passing all year, had become especially turnover prone in recent weeks, appeared to have lost a step in the running game and looked all-around tentative. Robinson put together his best all-around game of the year against the Cornhuskers, who feature the second-best defense Michigan has faced. It probably was Robinson's finest Big Ten performance of his career, rivaled only by the 67-65 win last year against Illinois. The junior didn't put up the video-game numbers he did early last year, but they were solid all-around: 11-of-18 passing for 180 yards and two touchdowns, and 23 carries for 83 yards and two more scores. But, the way he controlled the game, allowing it to come to him, was what made his effort most impressive. He showed good decision-making in the passing game, where instead of forcing balls, as he's done in recent weeks, he showed a willingness to scramble for the first time all year. It's been kind of odd, really. Because of his running ability, the fear coming out of camp was he would give up too quickly on his receivers and rely too much on his legs. The opposite, however, has been true. Robinson has been too reluctant to scramble, perhaps trying to prove he's a pocket quarterback. Against Nebraska, though, he showed what can happen if he reconciles the two extremes. He was dangerous with both his legs and his arm. He threw a perfect 46-yard pass to Roy Roundtree, then topped it with a 38-yard touchdown pass to a diving Martavious Odoms. Robinson threw the pass from just inside the 50-yard line, put just the right amount of touch on the ball to get it over two defenders, and Odoms hauled it in while diving in the back of the end zone. It was the most impressive pass of Robinson's career. Odoms quickly has become a nice role player for Michigan's receiving corps. The senior had only one reception through the first nine games, due in part to an off-season forearm injury that put him in a cast for the season's first few weeks. Now, though, he has four catches the past two weeks for 93 yards and two touchdowns. When Odoms was asked after the game about his big touchdown catch, it was revealed he and Robinson -- who was sitting to Odoms' left -- held a race last year. "Yeah, what happened?” Odoms said to Robinson. “No, you should tell them,” Odoms said. We're starting to see some of that speed now, and just in time for the senior. Robinson's day was exemplary, but he did make two mistakes. First, he had a pass deflected, then intercepted by Nebraska defensive tackle Terrence Moore. It was the junior's 14th pick of the year, fourth most in the country. It was Robinson's only turnover of the game, however, which is an improvement over his previous three games. Considering how much the Wolverines put the ball in Robinson's hands, they'll take that. Second, Robinson took a 13-yard sack on third down in the red zone, pushing an ensuing field-goal attempt from 29 yards, which is automatic for kicker Brendan Gibbons, to 42 yards, which was beyond his career long. Taking a sack there is better than forcing something and risking a pick, which has hurt him in the past. So, in a way, that shows growth. Still, in that situation, he has to find a way to throw away the ball, or at least avoid losing 13 yards. Gibbons, for his part, split the uprights on that 42-yarder, which was attempted straight into a gusting wind. He says he's confident out to about 55 yards, but had missed everything beyond 38 yards in his career. He answered some of those range doubts with the make. Gibbons did miss a 42-yarder later in the game, but his 9-for-13 mark is remarkable stuff. A year ago at this time, he was riding the bench after starting 1-of-4. It's amazing what 12 months and a coaching change can do for some players. Michigan was outstanding most of the year in the red zone — until last week, when it was just 3-of-6 on scoring opportunities inside the 20-yard line. It was back to business as usual against Nebraska. The Wolverines scored on all five red-zone opportunities, including four touchdowns. That accounted for 31 of their 45 points. With a quarterback as explosive as Robinson, and a tailback as good as Fitz Toussaint, the Wolverines ought to be proficient in the red zone. And, to their credit, they are. They're now scoring touchdowns on 64.4 percent of their red-zone opportunities, 38th in the country. The Wolverines continue to generate turnovers, although it was the special teams rolling up its sleeves this time. Michigan benefited from two fumbled kickoffs by Nebraska, a blocked punt and it executed a fake field goal. Overall, the Wolverines forced three turnovers. That helped Michigan win the field-position battle, which had been lacking for much of the year. It scored 24 points on drives that started from its 45-yard line or better. The Wolverines have forced 26 turnovers through 11 games, 11th nationally and the most in the Big Ten. They forced 19 in 13 games last year. Hoke may have developed his coaching strategy under the tutelage of Lloyd Carr, but he already has shown one sharp departure from his mentor. Well, an educated gambler, at least. Hoke has been aggressive all season in going for it on fourth downs, particularly near midfield and in the red zone. Now, he pulled out a fake-field-goal formation that Penn State ran against him while on Carr's staff in 1995. That fake, run in by holder Joe Nastasi, resulted in a touchdown that sealed a 27-17 win for the Nittany Lions. Sixteen years later, Michigan holder Drew Dileo did the same to the Cornhuskers. "You got it," Hoke said. "So you might as well use it." Dileo, a sophomore backup receiver, is a perfect candidate for such plays because he's athletic and elusive. And, he executed the play perfectly, hitting the hole up the middle hard, easily getting the first down and nearly scoring a touchdown. Toussaint finished the job a play later, scoring on a 1-yard touchdown run that extended Michigan's lead to 31-10. It took J.T. Floyd, Blake Countess and Thomas Gordon all falling down, but Michigan finally allowed its first 50-yard play of the season on a 54-yard touchdown pass from Martinez to receiver Brandon Kinnie. It's remarkable the Wolverines made it this far without allowing a 50-yarder. Only Utah had went so long without yielding a play of that distance. By comparison, the national average is around six. Michigan allowed eight last year. Hoke lamented the play after the game. But, you know, one's not so bad. Mon, Nov 21, 2011 : 3:51 p.m.
Mon, Nov 21, 2011 : 3:04 p.m.
Gotta like Michigan's chances after seeing the elevation in their play in the last 3-4 games. Even the Iowa game was not out of hand, though Michigan clearly got outplayed for stretches. But it seems the defense is gaining confidence just in time, and Fitz has established durability and escapability lacking earlier in the year, especially in the 4th quarter when Bo would pound the other team into submission. I think Braxton Miller as a frosh QB on the road is vulnerable. (Hopefully). Michigan breaks the streak this year. Mon, Nov 21, 2011 : 2:24 p.m.
Great article! I hope this continues! I truly believe that Denard was not 100% and this week may have finally gotten over some of those small injuries that have made him a little tentative. We played well in all three phases of the game and while this team still has room to improve, the confidence is overwhelming in all of the players. BTW, I noticed all of the players making gestures like putting food in their mouths. Some motivational coaching coming through there? Win #10 and BCS bowl game...HERE WE COME!!! Mon, Nov 21, 2011 : 2:58 p.m.
Maybe DR had some nagging injuries and now, or at least on Saturday, he was 100%. I hope so. Beyond that I hope what Al Borges said about things clicking has finally clicked for Denard. It wasn't just his running that looked better but for the most part he was setting his feet correctly when passing. Also, as pointed out in the article, DR balanced well the pass or run decisions. I don't think that is as much his being healthy as it is his being comfortable with what he's doing. I think, I hope, it clicked for him. Mon, Nov 21, 2011 : 1:58 p.m.
Mon, Nov 21, 2011 : 1:57 p.m.
Really nice article Kyle, and the discussion of the 3rd down defense and what it may mean for this next weekend was especially informative. Mon, Nov 21, 2011 : 1:36 p.m.
Mon, Nov 21, 2011 : 12:53 p.m. I like our chances to beat Ohio. We have the D to keep Braxton's running ability in check, and our D will flat out confuse and intimidate him during the game and force him into making some errors and turnovers. We will not need to score 45 points like we did on Saturday, but we will need another good game from Denard. If Penn State's offense can score 20 against the Ohio D in Columbus, then we should be able to score at least 28 or more. We will see another good game plan by Coach Borges, and as long as we don't turn it over alot we will win. Go Blue ! Destroy Ohio ! Mon, Nov 21, 2011 : 5:48 a.m. The defense will give another stellar performance against Ohio. Michigan just needs Denard to be Denard again. Great play calling by Borges; perfect use of Denard and Touissant. Mon, Nov 21, 2011 : 3:02 p.m.
Nice to see you back down from your criticism on Borges. I was thinking about your comments when I was at the game, and saw the time of possession, and wondering how people in your camp felt. It was a great performance overall. Mon, Nov 21, 2011 : 4:49 a.m.
Mon, Nov 21, 2011 : 3:01 p.m.
Mon, Nov 21, 2011 : 2:02 p.m. Agreed, Doug. That stuff makes my brain hurt. Part of it is probably because I'm a middle school teacher and I have to listen to that stuff day in and day out, but it's just something that's always bugged me. Mon, Nov 21, 2011 : 5:44 a.m.
Mon, Nov 21, 2011 : 4:30 a.m.
Mon, Nov 21, 2011 : 4:07 a.m.